Aren’t mornings really tough sometimes (er, most times)? I mean, you have to get up…fail #1. Then you have to get the kids up, about, and ready for school (ugh). Then you have to get yourself up, about, and ready for the day (c’mon, you’re killing me). Well, it’s times like this where you have to savor the small stuff. You know, life’s little victories. belVita feels your pain. Do you know what I mean? I know you do, stop pretending you’re that girl that gets up at 5AM to jog and has cold-pressed smoothies and sprouts for breakfast. My morning win has to be getting everyone up, out, and on time every morning despite major turbulence during the entire journey! 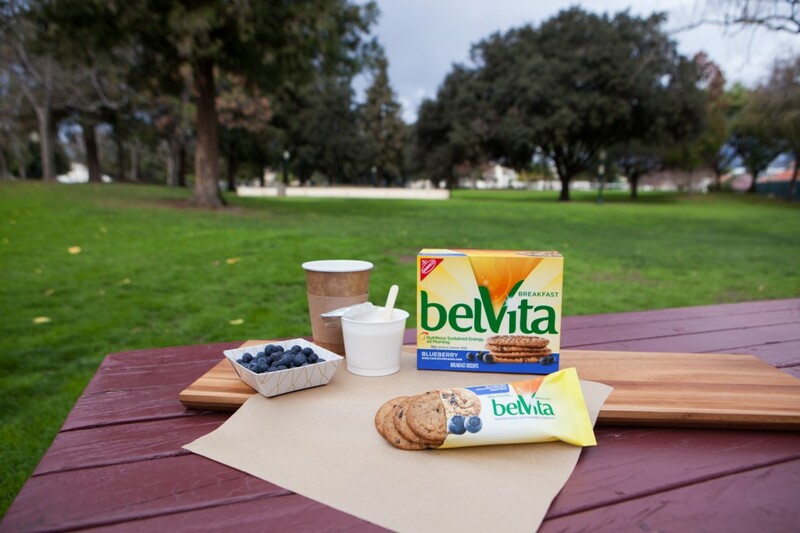 You know a healthy, tasty breakfast that’s ready to go with no mess is so key to achieving that win…thanks belVita! Maybe you should just have a belVita Breakfast Biscuit, too? What do you consider a Morning Win? Any win, no matter how big or small matters. If your idea of a #MorningWin is not burning toast or being able to get coffee while you’re running late to work, then belVita wants to hear about it. Check out the belVita #MorningWin commercial here and take a moment to explore the belVita YouTube channel for #MorningWin inspiration. If you follow @belVita on Twitter and share your own morning wins using the hashtag #MorningWin you have a chance to receive a personalized video, a virtual 3D trophy and/or a real morning win trophy. Now…we’re talking. A morning win for me is to actually be out the door on time and having had breakfast. For me a morning win is waking up on time and eating breakfast. Skipping breakfast usually lead to me over eating for lunch and feeling bloated later. My morning win is waking up after a solid eight hours sleep. A morning win, is waking up and not being very tired, because my elderly cat kept waking me up. gotta go with getting to sleep in. My morning win when I am backpacking is eating a good breakfast that gives me the energy to hike the miles. My morning win is a large glass of milk with protein powder and a pack of Belvita Blueberry! My morning win is when my sleepy-headed son gets up on the first call. Waking up before work and going to the gym. To have my coffeeand get out the door on time for work. waking up to my daughters is my win! My morning win is to stay home and hibernate more so now that we have piles of snow and sooooooo darn cold out there. Making coffee the night before so it’s ready for the morning run!!!! Being able to sleep in is a win. Getting out the door looking halfway decent with my coffee! My morning win is getting the kids on the bus on time! my morning win is sleeping in. Mine is getting to drink my coffee in peace before my son gets up. My Morning Win is to eat a healthy breakfast that includes Belvita, yogurt and fruit! My favorite breakfast! my morning win is waking up before the alarm goes off but still feeling refreshed. My morning win today was my phone has worked right all day and I finished my laundry. I love the new commercials. my morning win was to actually eat breakfast which i very rarely ever do. My morning win would be not to wake-up in pain – to just hop up & enjoy the day! my morning win was to actually eat breakfast and making it to work in the snow…. Waking up next to my Husband. My morning win is getting both kids up, ready, fed, and out the door. Having coffee and the crossword delivered to me in bed. Getting up with my husband at 5am and doing our hour morning walk before work. this morning my #morningwin was getting to work on time because the alarm didn’t get set last night. i am tony l smoaks on rafflecopter. My morning win is to wake up feeling rested. My morning win is having time to sit down and eat! My morning win is when I get the kids to school on time and I get to work on time! Thanks for the chance to win! Morning win..? ?/ getiing up without hitting the snooze. I like getting up without my alarm. My morning win is when I take my prescriptions on time. Taking them too early or too late just sets my whole day off on the wrong note. My morning win is starting the day with a healthy breakfast. My morning win is waking up feeling rested and ready to start the day! My morning win is after I get the kids dress, out the door, and to school on time. Then I can enjoy my first cup of coffee in peace. Getting to shower early without my daughter complaining too much. I’m retired now, so I get to relax in the mornings with a coffee and the newspaper and it seems great after all those years of getting the kids to school on time and to work. Thanks for having this contest. My morning win is eating breakfast at the dining room table rather than in the car, and remembering to take my vitamins! My morning win is making myself ride my bike to work, even when I want the extra sleep! My morning win is when I wake up well-rested. Thanks for the giveaway…a morning win for me is getting the kids up-fed-dressed-delivered to school and on time, four out of the last five school days..